Stories handed down from generation to generation can be both important family histories and frustratingly light on detail. My father told me the family story: there were three brothers who enlisted to fight for King and Country in the First World War. The brothers had to lie about their ages to enlist. After the war one brother emigrated to Canada, another to South Africa, and the third to Australia. The brothers never met again, but kept in regular contact through letters. The brother who settled in Australia was my great-grandfather, Andrew “Andy” Stewart Duncan. Any detail about his brothers was lost. I wanted to learn more about this story. Birth and census records on the ScotlandsPeople website soon found the Duncan family of 12 Duke Street, Newton on Ayr, Scotland. John Duncan and Elizabeth Stewart had ten children, one of whom died in infancy. Including my great-grandfather there were four brothers, not three: John, Andrew, Anthony and Hugh. They were born in 1879, 1882, 1884 and 1893 respectively. Army records identified that John, Andrew and Anthony had enlisted. John joined the British Army Reserve in January 1916, transferred to the 5th Army Reserve Scottish Rifles and later the Royal Army Veterinary Corps. Andrew had emigrated to Australia in 1912. 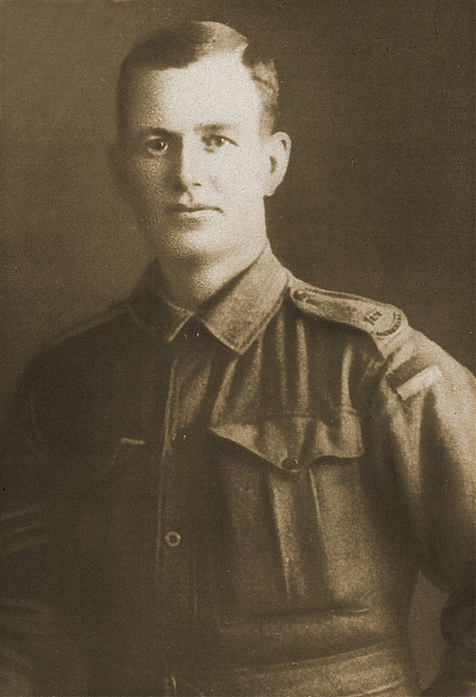 He enlisted in the 10th Infantry Battalion, Australian Imperial Force in August 1914. Anthony had emigrated to Canada in 1910. He attested for the 74th Battalion, Canadian Overseas Expeditionary Force in July 1915. I found service records and Medal Rolls Index Cards for soldiers named Hugh Duncan and Hugh Stewart Duncan but could not connect any of them with my great-grand uncle. I was unable to determine whether Hugh had joined up or not. Who lied about their age? A common part of the narrative of the First World War is that underage lads added a few years to their age, so as not to miss out on going to war. John, Andrew and Anthony were all in their 30s when they enlisted. And yet the family story was that the brothers had lied about their age to enlist. Where had that come from? Andrew had lied about his age – but in 1899, at the age of 17, when he enlisted for the Boer War. Who emigrated to South Africa? Anthony had sailed for Canada. Andrew had made Australia home. John survived the war and was back in Scotland to register the death of his father in 1922, and his mother in 1927. The only one unaccounted for was Hugh Stewart Duncan. There was no trace of him emigrating, or returning home. There was no Duncan emigration to South Africa after the First World War. Memories of Andrew’s Boer War travels had become mixed with later stories. What happened to Hugh Stewart Duncan? In the event of my death I give the whole of my property and effects to my father Mr. John Duncan 12 Duke St. Ayr. Hugh had joined the 1/5th Battalion of the Royal Scots Fusiliers. On 7 June 1915 he landed at Cape Helles on the Gallipoli peninsula, where he was critically wounded. Hugh died on 23 June 1915 of wounds received in action. He was buried at Lancashire Landing cemetery not far from Cape Helles. In searching for the truth behind the story of three brothers in the First World War I uncovered a forgotten brother. Hugh, the baby brother, died and was buried far from home. Andy spent 1902 serving in the United Kingdom, where he was promoted to Lance Corporal and then Corporal. He achieved his 3rd class certificate of education (required for promotion to Corporal) in November 1902. On 22 December 1902 Andy was part of a draft posted to India, where the 1st Battalion was on garrison duty. Andy’s service record in The British National Archives (WO97 series) gives only the briefest outline of his time in India. Hart’s Annual Army List confirms the regiment’s movements, while details of soldiers’ daily routine in the heat and dust can be found in Richard Holmes’ book, Sahib: the British soldier in India 1750-1914. The trip to India by steamer took about 6 weeks. Andy arrived in Calcutta [Kolkata] at the beginning of February 1902. Andy joined the 1st Battalion at Jubbulpore [Jabalpur] in Bengal. He had arrived at the coolest time of the year and the weather into March would have been quite pleasant; cold, foggy mornings giving way to warm afternoons. Once summer arrived, however, temperatures shot north of 40 degrees, and work in the heat of the day became impossible. In Sahib one soldier describes the weather in May as “hot as human nature can well support”. The monsoon season brought some relief, but temperatures remained around 30 degrees until winter arrived in November. As a new arrival, Andy was probably baited with tales of the poisonous snakes and man-eating tigers that lay in wait for the freshman soldier. There was some truth in these stories, as death by snake-bite was quite common in Jubbulpore. Tigers were less common, but did appear from time to time and caused great excitement. A tiger had been shot on the Jubbulpore golf links a few years earlier. 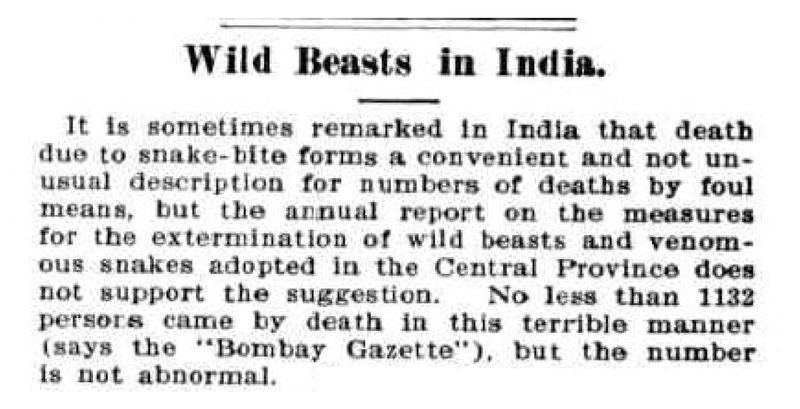 “Wild Beasts in India.” Australian Town and Country Journal (1900, November 17), p.38. Newspaper article found in Trove reproduced courtesy of the National Library of Australia. The nature of garrison duty in India meant that soldiers often had time on their hands. This gave Andy the opportunity to continue his education and work towards attaining his sergeant’s stripes. He studied writing and dictation, mathematics including proportions, interest, fractions and averages, and all forms of regimental accounting. While only officers were required to study the Hindi language, Andy almost certainly learned enough colloquial language to speak pidgin Anglo-Indian with battalion servants and locals. When not on duty men would occupy themselves by drinking, gambling at cards, playing backgammon or chess, and reading. Crafts were a popular activity. Perhaps it was in India that Andy learned or developed his woodworking skills to pass the time. A parquetry drinks tray and cribbage box crafted by Andy in later years have been handed down in the family. Andy passed his class for rank of sergeant on 21 September 1903, and was awarded his second-class certificate of education on 23 March 1904. The constant jabbering of the natives, and the roaring of the camels, together with elephants and buffaloes, reminds one of the striking contrast between India and peaceful England … The women of Bengal beat all I ever saw, for they will fight, and keep up such a chatter that they may be heard above the din of the Camp. Ranikhet was a forested hill station in sight of the western Himalayas. Andy would have welcomed the cool summers after the heat of Bengal and the central plains, but the heavy snow and near-zero temperatures in December would have required some adjustment. Ranikhet Cantonment, Uttarakhand. Postcard from the author’s collection. Copyright Andrew Palmer. Andy was promoted to Sergeant on 28 January 1907. He then sought and was granted permission to extend his service to complete 12 years with the colours. The battalion remained at Ranikhet into 1908, then moved to the Lahore Cantonment (now in Pakistan). The battalion’s activities in northern India were set against a background of increasing civil and religious unrest across the country. British newspapers reported concerns of seditious acts in the Punjab, political agitation in Bengal and Calcutta, and “the promotion of mischief of the gravest and most formidable kind” in Lahore. From May 1907 British troops were on patrol in Lahore, prepared to act swiftly and firmly against any challenge to British colonial rule. The South Lancashires would remain in the north of the country until the beginning of the First World War. In 1909 Andy was posted to England for 6 months before rejoining the battalion. In 1910 he completed a musketry course at Changla Gali. 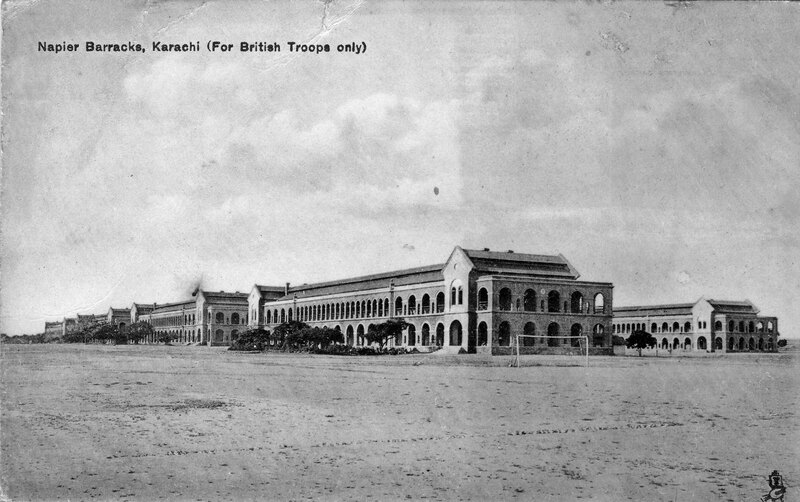 The 1911 British Census records Sergeant Andrew Duncan stationed at Napier Barracks in Karachi. Postcard from the author’s collection. Copyright Andrew Palmer. On 2 December 1911, having completed 12 years with the regiment, Andy left the British Army. He made his way to Australia, sailing from Calcutta. No longer Sergeant. Mr. A. Duncan sailed on the SS Janus from Calcutta to Australia in December 1911. VPRS 7667 Inward Overseas Passenger Lists (Foreign Ports). Public Records Office Victoria. Ancestry.com. 1911 England Census [database on-line]. Class: RG14; Piece: 34989; Page: 2. Provo, UT, USA: Ancestry.com Operations, Inc., 2011. British Army Service Records. The National Archives UK. WO96/684/108. Holmes, R. 2006. Sahib: The British Soldier in India 1750-1914. United Kingdom: Harper Perennial. VPRS 7667 Inward Overseas Passenger Lists (Foreign Ports). Public Records Office Victoria. Featured image: British Infantry line, Mhow Cantonment, India. Postcard from the author’s collection. Copyright Andrew Palmer. THE TRANSVAAL. (1899, October 2). The Sydney Morning Herald (NSW : 1842 – 1954), p. 5. Newspaper article found in Trove reproduced courtesy of the National Library of Australia. Andy joined the British Army in September 1899 as talk of war between Britain and the Boers reached fever pitch. The family story is that Andy lied about his age to enlist, and his attestation papers record his age as 18 years 1 month when really he was only 17. He was described as 5 feet 4¾ inches tall, with fresh complexion, blue eyes, brown hair. Andy served in the South Lancashire Regiment from 26 September 1899 to 2 December 1911. He volunteered first for the South Lancashire Militia and soon transferred to the 1st Battalion, nicknamed the “Fighting Fortieth”. His military records indicate that he served in the 1st Battalion in South Africa and later in India. Andy was not in the first South Lancashire contingent to sail for South Africa. On 30 November 1899 Andy would have joined the wildly enthusiastic crowds farewelling the South Lancashires as they marched out of the barracks. Andy was probably disappointed not to be going himself. Men were desperate not to miss out on an adventure that many thought would be over by Christmas. Private Duncan finally departed for South Africa in early June 1900. It is likely that he sailed from Southampton on 8 June on board the newly-built RMS Tagus. John Downham’s book, Red Roses on the Veldt: Lancashire Regiments in the Boer War, 1899-1902 helps to expand upon the terse entries in Andy’s service record. The voyage to South Africa would have been new and exciting for young Andy. Dolphins leapt and raced alongside the ship as it sailed south, the waters alight with phosphorescence at night. On board, the daily routine included cleaning the ship, physical drills and rifle practice. Men passed their off-duty hours playing cards or holding impromptu smoking concerts, at which each man was expected to sing or recite verse. Perhaps Andy recited the poems of Robbie Burns, which he was known for in later years. The ship reached Table Bay on 29 June. It was a period of relative quiet in South Africa: large, formal military operations were all but over, the capitals of the two Boer republics were under British control, and some British observers were predicting the end of the war. But the Boer guerilla campaign was just beginning. Andy travelled north from Cape Town to join the regiment in the southern Transvaal, where they were tasked with securing rail and telegraph lines between Standerton and Volksrust. Their duties included digging trenches to protect the camps, manning isolated outposts along the railways, and patrolling the lines. They kept a close eye on Boer farms in the area and conducted searches for arms. When ammunition or weapons were found, orders were to confiscate farm stock and burn the farm. The Boer commandos were never far away; the soldiers had to remain vigilant and ready to fend off raids on the camp. On 4 September 1900 the battalion marched south-east as part of the 11th (Lancashire) Brigade. It was a 90-mile march through Wakkerstroom to Utrecht and on to Vryheid. Andy would likely have escorted guns and equipment carriages pulled by slow-moving oxen. The march was dusty and dirty. Men’s feet blistered and bled. The weight of their rifles bruised their shoulders. Tents or shelters were rare and there was little opportunity to wash off the accumulated mud, blood and sweat. At the end of each day Andy would have slept in the dirt, his greatcoat wrapped around him as protection against the bitterly cold night. The 1st Battalion took up garrison duty at De Jager’s Drift on the Buffalo River on 10 November. Here Andy spent an uneventful two months, though not far away at Vryheid the Boers mounted a serious attack that killed 11 men. The South Lancashires left De Jager’s Drift in January 1901 to relieve the Vryheid garrison. The 3 day march saw several brushes with the enemy but no serious fighting. On 14 January the Battalion reached Vryheid and entered the garrison on Lancaster Hill, a high rocky plateau on the northern outskirts of the town. Andy would spend the rest of his time in South Africa stationed here. Once defences were strengthened and the threat of attack had died down, Andy would have settled into a routine of parades and drills, work parties and outpost or sentry duty. Despite Vryheid being relatively peaceful throughout 1901, the South African weather and the British army staple diet of ration biscuit and bully beef continued to take a toll on the regiment. Of the thirty-five deaths in the South Lancashires while Andy was stationed at Lancaster Hill, twenty-one of them were from illness or disease. Another two deaths were caused directly by the elements: one due to sunstroke and one due to a lightning strike (which also injured eight others). Andy fell ill with enteric (typhoid) fever on 14 November 1901. His condition was first reported as “dangerously ill”, but by 30 November he was considered to be out of danger. Andy was posted back to England 29 January 1902, before the final major battles of February – April. He had passed his initiation into military life. He was awarded the standard service medals for his time in South Africa: the Queen’s South Africa Medal with clasps for service in Cape Colony, Orange Free State and Transvaal, and the King’s South Africa Medal with two clasps for service in South Africa in 1901 and 1902. Anglo Boer War website – Shipping records – June 1900. 2013. [ONLINE] Available at: http://www.angloboerwar.com/other-information/86-shipping-records/1802-shipping-records-june-1900. [Accessed 19 April 2013]. British Army Service Records. The National Archives UK. WO96/684/108; WO97/4738/080. Downham, J, 2000. Red Roses on the Veldt: Lancashire Regiments in the Boer War, 1899-1902. Lancaster, UK. Carnegie Publishing Ltd. Roll of Honour – Ships – RMS Tagus. 2008. Roll of Honour – Ships – RMS Tagus. [ONLINE] Available at: http://www.roll-of-honour.com/Ships/RMSTagus.html. [Accessed 19 April 2013]. Andrew Stewart Duncan c.1915. From the author’s collection. Copyright Andrew Palmer. My great-grandfather Andrew “Andy” Duncan was a soldier for a good part of his adult life. The military service that defined him to his wife and family was his enlistment as an original Anzac, but by 1914 Andy already had 12 years’ British Army experience in England, South Africa and India and a year in the South Australian Militia. The story of 17 year old Andy joining the army and travelling the world is seldom told and the details almost forgotten. By piecing together war diaries, military histories, newspaper articles and family stories we can start to see the man with a love of empire and military tradition, a strong sense of civic duty and an independent streak that sometimes got him into trouble. While there are gaps in the story and questions that might never be answered, the 100th anniversary of the First World War seems a fitting time to tell Andy’s story. It’s not so straightforward to say where home is after living in numerous places in Australia, Japan, New Zealand and Australia again. I sometimes feel homesick for Japan, though my wife asks how an Australian can use that word about Japan. Now I live in Geelong, Victoria. As I’ve learnt more about my forebears I’ve been surprised to find how many of my earliest Australian ancestors lived or passed through Geelong. Five of my great-great-great grandfathers were here in the 1850s. Two free-settler British ancestors first set foot on Australian soil here, John Nicholls from Cornwall in 1849 and Henry Palmer from Kent in 1852. John was a miller, Henry a bricklayer. Another free-settler, Somerset labourer Solomon Ball, married Frances Victoria Hemmens at Christ Church, Geelong, in 1855. One of my convict ancestors spent some time in Van Diemen’s Land first, but later came this way. Henry Steward, transported for 14 years for stealing a velveteen coat and a pair of trousers, came to Geelong around 1846 after receiving his conditional pardon. He worked as a carpenter and stonemason in Geelong district. Henry buried four of his children during his ten years in Geelong. During the gold rush George Powell walked 85 kilometres from Ballarat to Geelong to deposit his gold in the bank. Riding a horse would have made George a potential target for bushrangers, so he chose to walk. Gold, land or work drew all these families to Ballarat, where I was born generations later. I am proud of my Ballarat history, but it also feels right to have put down roots in Geelong. Posted on July 9, 2014 October 26, 2014 Categories AustraliaTags Family History, Frances Victoria Hemmens, Geelong, Genealogy, George Powell, Henry Palmer, Henry Steward, John Nicholls, Solomon BallLeave a comment on Where am I from?